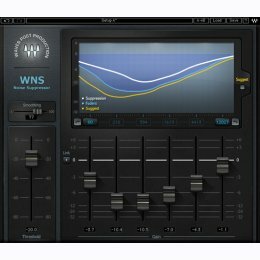 The first in the new line of dedicated Waves Post Production tools, the WNS Waves Noise Suppressor is a real-time multiband processor for fast and effective broadband noise suppression on dialog tracks. Suitable for both indoor and location recordings with constant or modulating environment noise, WNS delivers superior sound quality with minimal artifacts. Designed from the ground up especially for Post professionals, the workflow, approach, and interface of the WNS will be immediately familiar to Post engineers. WNS offers all the flexibility, portability, power, and precision of software, like true Pro Tools integration, multiple simultaneous instances, and full automation.